Criminals, fugitives will be monitored by “drones” (unmanned aerial vehicle) designed specifically for the police. 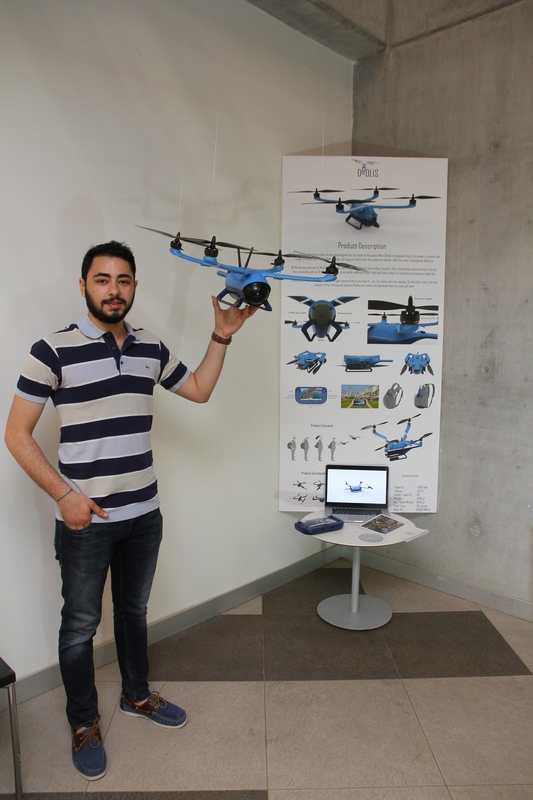 Mustafa Murat Bilir, Graduate, Department of Industrial Design, Faculty of Fine Arts and Design, Izmir University of Economics (IUE), designed drones for new generation police officers by taking the hardships go through into consideration. Bilir reported that with his project titled “Drolis” he aimed to accelerate use of drones by police officers. He said, “While I was designing Drolis I thought about the time it would take to be used. I designed a case for it as well. It makes the time to use it shorter. As the user carries Drolis on their back, they can easily take it and start using it in seconds by touching a single button”. Bilir said that drone would not be lost thanks to GPS system and even if it were out of sight, it would be retrieved with a single button. He also said that the sound solar sensors on the drone were able to detect the obstacles missed by the user. Bilir pointed out the importance of police officers using drones nowadays, and said that he designed a quick and easy to use drone.